Create a distinct bookmark for your customer’s reading habit. Print metallic bookmarks for your customers to take home after a book launch, reading, or sale. Your brand becomes a dazzling part of their favorite past time, whether they’re catching up on reading or closing the last chapter. A metallic custom bookmark instantly shines and sticks out. Lighter colors no longer appear pale next to darker shades. The foil-like effect gives darker colors a sleek, elegant touch. All metal bookmarks are printed on 16 pt. cardstock. Its premium weight and thickness give your design a luxurious appearance. 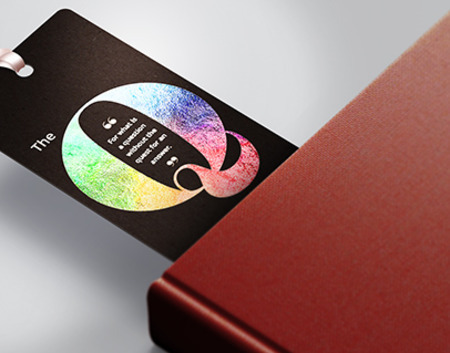 Choose from two coating options that elevate the elegance of your custom bookmark design. Keep the surface uncoated to complement the metallic accent’s glimmer or add high gloss UV coating for a smooth, shiny background. You can also add a 1/8" hole at the top center to add your own tassel. Choose from three standard sizes for bookmarks. 2" x 3.5" is ideal for small, compact designs. 2" x 4" is our medium-sized option. Perfect for a few important details on your company. 2" x 6" is the longest and most popular size available. Your design can strike a balance between words and images. Spot UV draws a customer’s attention to certain elements, such as your logo or slogan. Words or images are given a smooth, shiny gloss that complements the metallic areas. Print metallic bookmarks today for your next big book event. Not sure how to begin? Download one of our templates as a guide. Our print experts are also available to answer all your questions. How should I prepare my metal bookmark for printing? You will submit two files for metallic bookmark printing orders: the CMYK file and the silver foil mask file. On the mask file, mark the sections for metallic printing with 100% K or black. Mark the non-metallic areas with white. What should I keep in mind while creating my custom bookmark? Text with metallic printing shouldn’t be too small or thin. Keep the font size above 12 and use Sans Serif fonts for readability. The metallic, foil-like effect works best on light colors. Apply spot UV printing or have a high gloss UV surface for darker elements. When can I expect my metallic bookmarks order? Custom bookmark printing takes 7 business days. After those 7 days, your order will be shipped to the indicated address. To find out when you can expect the order, select “Get Estimate” on the online calculator and input your ZIP code. Download the layout template below for your metal bookmark dimensions. It will help you verify that your artwork meets all of our guidelines. This means checking if your text fits inside the caution zone and your design bleeds to the paper’s edge. Bookmarks are the go-to promotional opportunity for book authors and publishers. Keep these tips in mind to create memorable custom bookmarks. Let your main title shine. Apply metallic printing on your publishing house’s logo or on an image of your book’s central character. Create mini versions of your book covers. Stay on brand and use the same colors as your book cover on the bookmark. Balance out the shine. Contrast your bookmark’s metallic elements with an understated uncoated background. You could also apply a high gloss UV coating for a complementary shine.